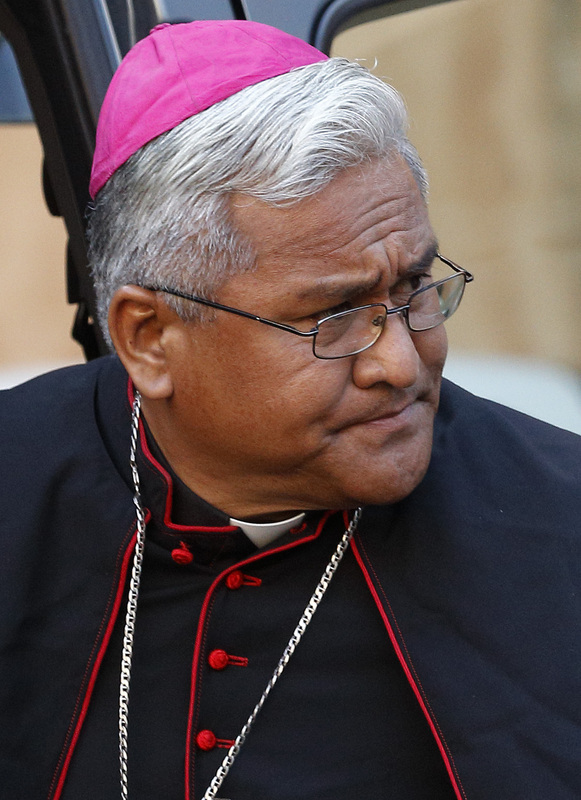 Bishop Soane Patita Paini Mafi, 53, leads the Catholic Church in the Kingdom of Tonga, 176 islands spread over 270,000 square miles in the South Pacific. Ninety percent of the Kingdom’s approximately 102,000 citizens are Christian, of which 16,000 are Catholic. Tonga is one of the most developed island nations in the Pacific. In recent years the Kingdom has had struggles over disparities in wealth and power between its nobility and citizens. In 2010 for the first time the majority of Parliament was chosen via election rather than royal appointment. Appointed Coadjutor Bishop in 2007 at age 47, Bishop Mafi said at the time “I did not know whether to jump up or cry ‘Why me?’” Today in addition to his role as Bishop, Mafi serves as President of the Episcopal Conference of the Pacific, which covers the largest territory of any conference in the world. Bishop Mafi will be the youngest member of the College of Cardinals, able to vote in the election of new popes until 2042. How do you feel about being named cardinal? How has your family reacted? Surprised, apprehensive, very humbled, reflective of being specially called, and very grateful—to God, my grandparents and parents (all deceased). My family—five brothers and only sister, the youngest—and extended family were surprised and all so proud, excited, and humbled at the same time; so thankful and praising God. What do you hope for the church today? That the church becomes a humble church, but filled with the ‘fire’ of the Spirit; a church filled with deep and lively conviction and experiences of the indwelling reality of the Holy Spirit. A church that her members are moved with passion to share and spread the "good news" of their faith-filled experiences in their daily lives, so that others would realize their own and in turn share theirs to others and so on and so ultimately hope is once more restored within the church and throughout the world. What is one message you feel the church should be offering to today’s world? The Hope and Mercy of God. What are the most pressing issues facing your region and community? In addition to our permanent vulnerability to the impact of climate change and global warming, especially to our low lying areas in the Pacific, the negative impact and increasing challenges posed by globalization is to me another concern to be watchful for. Besides its positive influences globalization can create the tendency to be more distracted and become more materialistic and even "sophisticated." It therefore can cause breakdowns in our traditional social and simple communal way of living and tend to make us more individualistic. Another issue is the tendency to "religiosity" with just superficial and shallow faith that needs to be deepened—thus my Episcopal motto, “Deepen the Faith.” There are also so many sects and denominations around; it creates the mentality of saying, “It doesn’t matter which church to go to, it’s the same God.” Thus, our church has to shine out with the beauty of our Catholic faith so as to attract and draw people to its richness, beauty and the joy of its "good news." What has your work and your community taught you about God and the church? That God is very much experienced and found in simplicity and "ordinariness" of people’s lives. That the face of God is, in other words, found in the poor and in their stories of struggle and suffering in real life. That God is a patient God who always listens to the constant prayers of His people, despite being often felt that He was not. I have personally seen this among our people and especially in my own parents—it was the same thing with my grandparents, they often told me—their consistency in morning and evening prayers, rosaries and all other Catholic devotions. Thus, for an example, I am convinced that my own call to priesthood, Episcopacy, and now the Cardinalate, is the sure fruit of the prayers and dedication of simple people such as my dear parents who were so committed to loving their God and caring for their children and all those who were around them. What’s an image of God, passage from scripture or figure from church history that you look to for support and encouragement? The image of the sculptor often strikes me as an analogy of how I see God working in my own life throughout my life history—gradually chipping and chopping out things in my life, putting on or plastering certain points in me and molding me slowly till I shape up to become who I suppose to be, the real person I am as made according to Him—The Sculptor. Imago Dei!! In the early days of my life, during my school years, I was always moved whenever I recalled the fact that Jesus had "dared" to call his followers “His Friends.” This image of a “Friend” seemed to have remained with me and sort of defined my own spirituality in many ways. The story of the two disciples on the way to Emmaus is always quite representative of a big part of my life in faith, too—so encouraging especially in times of doubts and disillusionment. Finally: what are your hopes for next October’s Synod? That it will create a new fervor in the church in the promotion of the sacredness of Christian families. That there will be a spirit of friendliness, trust, openness, listening, respect and dialogue, in order to really come to what the Holy Spirit would want the Synod to come up to. That some clear strategies and guidelines in the level of pastoral applications be set out in order to assist the local churches in their own particular applications to various family issues and challenges.